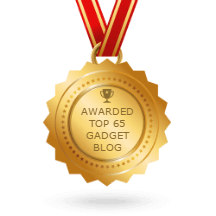 The LG G5 is one of the hottest Flagship in the market and maybe you are the lucky owner of this Flagship. The LG G5 comes with stylish design, high performing processor, and several unique features. Well, if you already owned this smartphone or booked it recently, then it’s time to keep your device secure. You can save your LG G5 from scratch or physical damage using a case or cover. You may like to use a crystal clear back cover, bumper, heavy duty case or wallet style cover. Here, We are going to discuss and share some best LG G5 Cases and Covers that can protect your G5. 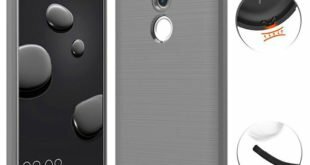 You can choose anyone from this list of LG G5 Cases if you like to use a case. So let’s have a look below. 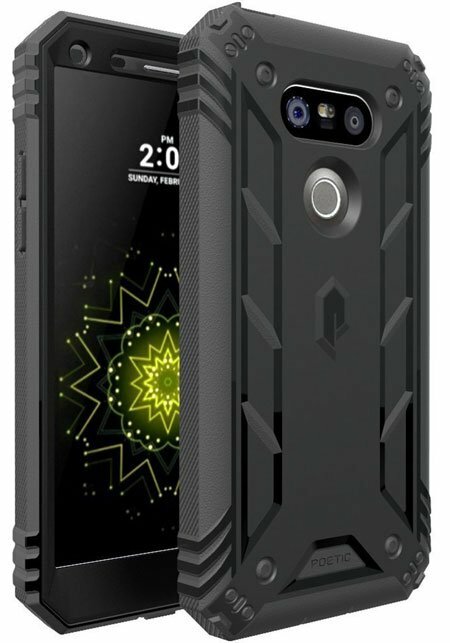 Introducing to the POETIC Revolution Series Rugged Hybrid Protective Case for LG G5. The case comes with a built-in screen protector to keep your G5 screen safe from scratch or fingerprints. The premium quality Polycarbonate and soft TPU materials ensure maximum protection against drop, bumps or any kind accidental damage. The unique corner protection design helps to protect your phone from accidental drop damage. And the raised edge will keep the screen safe from ground touch. The case is available in 4 different colors. One of the top rated and best-selling LG G5 case on Amazon. Introducing the premium quality OtterBox COMMUTER SERIES Case for LG G5 that available in three different colors. The premium and heavy duty build cases come with the thin and lightweight design. This is the ideal case to protect your expensive G5 from shock, drop or bumps. A self-adhesive screen protector included with this case to protect your device screen from fingerprints or scratch. 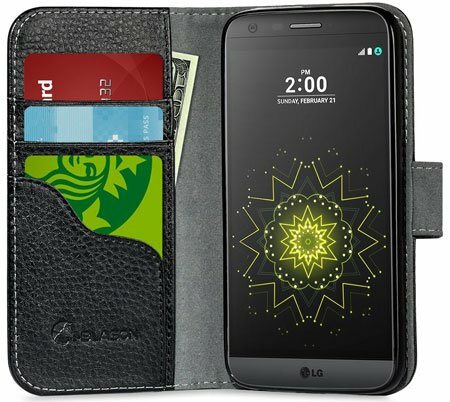 If you are looking for a Stylish and Fashionable LG G5 case with ultimate protection, then you can consider the E LV LG G5 Case. The case is available in five different colors with two-tone color technology. An inner layer of TPU Polycarbonate shell provides superior protection against shock, drop, bumps or scratch damage. The super smooth grip ensure maximum comfort for operating the device in one hand. If you are looking for a lifeproof LG G5 Case, then have a look at the Lifeproof FRĒ SERIES Waterproof Case. The case comes with built-in scratch protector to protect your G5 from scratch, dust, dirt or water. The case specially designed for the G5 so that it will fit perfectly and you can access all buttons, headphone port or charging jack easily. The IP-68 grade ensures the case is waterproof enough to keep your smartphone safe from water splash or rain. An ultra-clear case can protect your smartphone without hiding its original outlook. 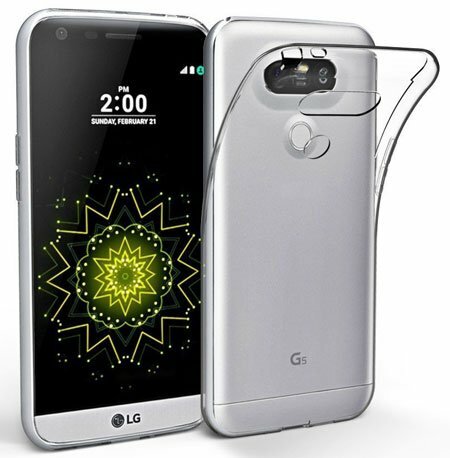 The EasyAcc comes with a crystal clear transparent bumper case cover for the LG G5. The case is entirely transparent that made of high-quality and soft TPU materials. 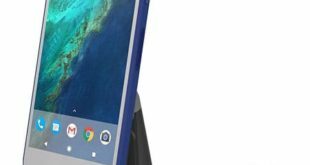 The TPU can absorb shock and hit to protect your G5. And the anti-slip feature helps to operate your smartphone with one hand. The OBLIQ is one of the most popular and well-known brand for smartphone cases, covers and accessories. They come with the Premium Quality Flex Pro Series LG G5 Case. The case specially designed for Official LG G5, Verizon, AT&T, Sprint and International Unlocked version. As the case fits perfectly, so it will keep your device safe from scratch and instant drop damage. The case also comes with shock absorbing TPU materials, so it will also keep your device from shock damage. The case designed in the USA and manufactured in Korea. The Spigen® LG G5 Case is a premium quality case and compatible with the latest LG G5 edition. The case made of high-quality TPU materials and comes with Air CushionTM Technology. So your device will remain safe from any kind physical damage, drop damage, shock and scratch. The premium quality carbon fiber of this case ensure the best user experience. The Precise cutouts ensure easy to access the camera, headphone outlet, speaker and all buttons. 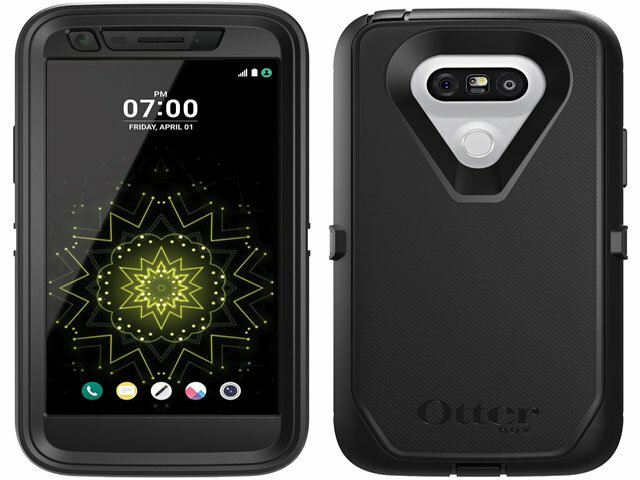 Looking for an expensive and premium quality LG G5 Case, then the OtterBox DEFENDER SERIES Case for LG G5 will be perfect one for you. The case made of high-quality materials, stylish design, high protection and three different colors. 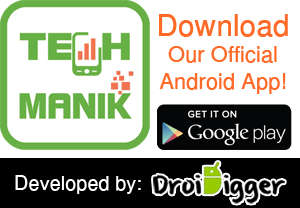 You can easily keep your expensive smartphone safe from scratching, cracking, shattering and denting while you’re out living. The hands-free kickstand helps to access your device easily and browse or type frequently. You will also get a 1-year official warranty from the OtterBox. Yu may already popular with the Caseology® brand and may use their case for other smartphone or tablet. 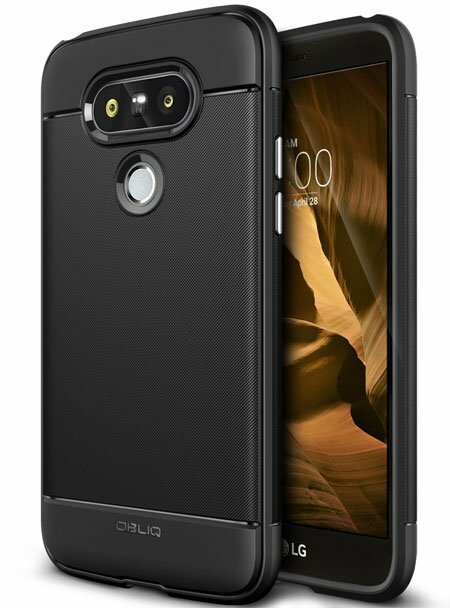 The Caseology® case is available for LG G5. So if you like to use their case, then you can buy the Caseology® LG G5 Case at a reasonable price from Amazon. The case available in 5 different colors and made of heavy duty materials. The back side comes with Soothing Texture that will ensure a comfortable fit in your hand. The TPU sleeve and polycarbonate bumper help to protect your device from any kind scratch and drop down damage. Some people don’t like to hide their expensive smartphone design, so they use a crystal clear back cover/case to protect their device. If you are one of them, then the PLESON® LG G5 Case is for you. The premium quality crystal clear bumper keeps your device safe without adding extra bulk. The case durable and flexible enough and the precious cutouts ensure easy access to all sensor, buttons, camera, and speaker. The advance anti-water mark and the anti-fingerprint feature will keep your case clean and clear. Looking for a heavy-duty case for your G5 with some attractive features and high protection. 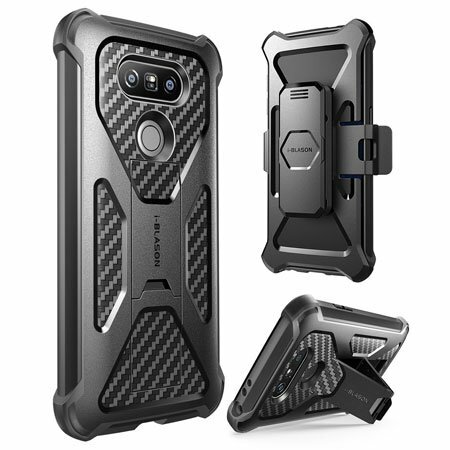 Then I would like to suggest the i-Blason Prime Combo Holster Cover case for LG G5. This is a high quality and heavy, durable case that is specially designed for the LG G5 2016 Edition. The most attractive feature is that the case comes with two pieces hard back case; one is a kickstand, and another one is locking belt clip swivel holster. Using the belt clip, you can attach your device to the waist belt and keep your device safe in outdoor. Love to use a stylish designed case to protect your device? 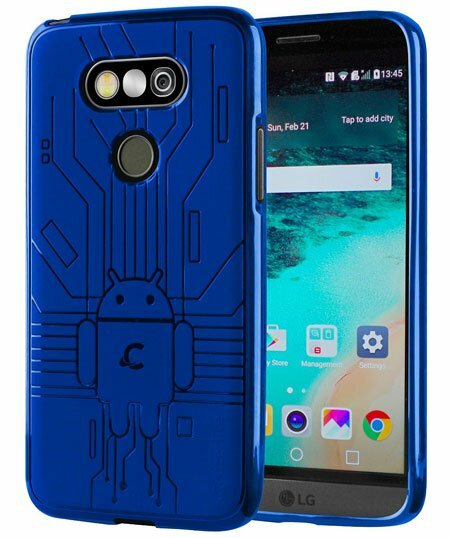 Well, the Cruzerlite Bugdroid Circuit TPU case for LG G5 is here with unique design and eight different colors. Like the other high-quality case, this one also made of durable TPU materials. So it will ensure your device protection against scratch, drop or hit damage. If you are a fan of leather cover and love to use to keep your smartphone safe then the i-Balson Leather Cover is for you. The cover comes with Credit card holder feature, so you can also store your credit card, debit card, I-card or money. The cover made of 100% original Vagan Leather and available in Black color. The inner side of this cover made of soft materials, so your phone will remain safe from scratch. You can also turn your cover as stand case to enjoy live messaging, video chat or movies. 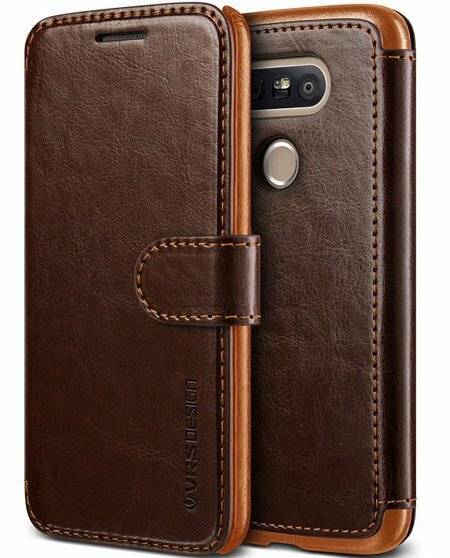 The LG G5 Cover by VRS Design is another premium quality leather cover available in 3 different colors; black, coffee brown and wine red. 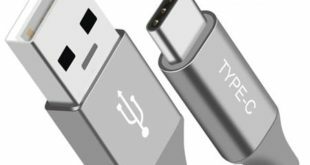 The custom fit design will fit your design perfectly and protect all corners of your device. There is a magnetic clip available on this cover to ensure faster and hassle free access to your device. Spigen also comes with a premium quality LG G5 Leather Cover. There are also ID card slots, credit card slot and money slot available in this leather cover. You can store three credit/debit/ID card and keep some money in this leather cover. The cover made of premium quality synthetic leather and polycarbonate materials and available in only black color. So these are some best and top rated LG G5 Cases and covers currently available in the market. All of these cases come with premium quality, stylish design and reasonable price. So you can get anyone to protect your G5 from any kind scratch or damage. mobile look good and different from other designs. Thanks for this great post.